Join bookseller Lauren Napoli in July to discuss Adrian Tomine's Summer blonde. "With a deft and romantic touch, Tomine portrays the emotional ambivalence of drifting, urban twenty-somethings in stunning black and white. His fans accuse him of eavesdropping on their most intimate moments, exhibiting their insecurities with both forensic detachment and surprising compassion." Here's a link to our facebook group! Award winning cartoonist and illustrator, Adrian Tomine, will be at Pegasus Books Downtown to present New York drawings: A decade of comics, illustrations, and sketches from the pages of The New Yorker and beyond. 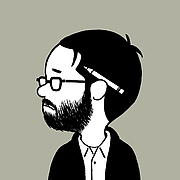 Adrian Tomine is currently considered a "single author." If one or more works are by a distinct, homonymous authors, go ahead and split the author. Adrian Tomine is composed of 4 names. You can examine and separate out names.